good show need new ones! Hollywood Saloon has made some of the best podcast I have ever heard on any topic. Listen to the Bond shows, or the car chase show and you you will understand what I mean. They are in-depth, funny, and very well-produced. They discuss the technique and culture of cinema rather than just voice opinion on films. Recently, however, the shows--when they come out which isn't often--have focused on the endless stream of mediocre superhero movies: Thor, Green Lantern, Captain America, etc. Yawn. There are amazing movies like Hugo and The Artist just begging to be discussed in detail but the Hollywood Saloon just passes them by. Puzzling. I love to hate this podcast. I listen to a show and may agree with about 40%, but as for the other 60% the two hosts are so far off it is embarrassing. Do not believe me? Go listen to the show, e. g. the one about "Serenity", and then compare the predictions made in the show with the reality. Or check out the more recent show about "Tintin", I would like to believe one of the hosts had the 10 second it takes to find out the correct pronunciation of Hergé. When Mr. Janson on the very same show talked about the Chinese market with its seven billion people, I had it. This is ridiculous! But I don't Want to Pay to have someone continue to waste time and not release shows. Maybe you wouldn't have to release donation paks if you actually would release shows on a decent schedule. An Avatar Show Really. Almost 4 years later and we get avatar. How do you spend almost 4 years editing one 2 or 3 hour show.. A star Trek review come on man the sequel is already coming out. "The Hollywood Saloon" is, hands-down, the most well-produced, entertaining, and informative film discussion podcast on the Internet. The hosts, John and Andy, do an excellent job of drawing the listener into their discussion without ever making the show sound like a dry film class lecture. The range of topics is wide and deep. Everything from classic franchises, important directors, current film industry events, car chases, new summer releases, movie marketing, home video release in all its formats, and so on. A common complaint is that the show releases come with long gaps of time. But that has nothing to do with the quality of what you get. With over six years of "The Hollywood Saloon", you'll never be wanting for an interesting episode while you wait for the next new release. This is a great podcast (in general), not gonna argue that, but the latest episode irks me a little bit. You guys have done a grand total of three actual podcasts this year and your latest offering is a podcast talking about possible podcasts and worse, asking for money. Not only did you not actually give us a "real" podcast but your claiming poverty in order to subsidize putting out more? Now Playing (for example) averages about a podcast a week and when they ask for donations, its worth it. They are putting in the time and effort despite having their own lives and commitments. Asking for people to pay for a podcast that never got around to the rest of the summer movie lineup nor has managed to get more than a couple of podcasts out in ten months is a bridge too far. Love the show and will keep listening but until promised podcasts are actually released and on a more frequent/regular basis, I will not be donating nor think anyone else should either. Sorry. Hollywood Saloon is both informative and incredibly entertaining. Andy and John know their stuff and present a no holds barred podcast that has no equal. Highly recommended. Great work guys! Keep 'em coming! I have been a loyal listener to THS for years. It's well produced, informative and a lot of fun. John and Andy make each episode feel like you're having a discussion with your close friends. They cover a wide range of material, from the pop culture of the day to the master filmmakers of the past. I only wish there were more shows! If you are a fan, please check out their website as it has a ton on material not available here on iTunes. Nothing pretentious here folks. Especially those of you entering film school. You will get bogged down with heavy theoretical marxist interpretations of The Wizard of OZ. Remember why you love cinema...it's Here !!!! -TA . An Excellent Podcast for Deep Film discussion. The Hollywood Saloon is back and in top form giving its fans what they want deep discussion about films. This isn't a review show instead the guys at the Hollywood Saloon take apart their topics and delve deeply into what makes Hollywood (for better or worse) tick. When you download the podcast you will essentially get two types of shows, first the long form main topic shows then there are the Saloon Shots that are shorter shows that cover topics that don't merit 2-3 hours of discussions but are interesting non-the-less. If you like talking about movies then this is the podcast for you! The single best podcast on itunes. Anyone who enjoys film in the slightest should listen to this podcast. Its not another review show or boring talk about the movie industry's latest events. THIS is a podcast that makes sure every episode is OSCAR WORTHY. while the show's look long, they go by very fast by keeping the listener entertained with discussion, music clips, movie clips, and interviews. Add that along with some amazing humorous moments, and you have a top-notch podcast. While some might complain that it takes some time between shows, John and Andy dont want to just shove out an incomplete project. i've been subscribed since 2007, and I plan to keep being subscribed for a very long time. JOHN AND ANDY ARE AMAZING!!! YOU GUYS KICK A**!!!!! KEEP UP THE INCREDIBLE WORK!!! The business and pleasure of film. Not only do Andy and John discuss the movies themselves but they also talk about the business of filmaking. If you enjoy either then give Hollywood Saloon a listen. It's the perfect mixture of clinical and fanboy movie talk. Plus, look at the content your getting for free: the James Bond shows alone are hours of listening pleasure. So if you enjoy the Saloon, then donate as well. Keep quality podcasts like this alive! Stop.Yes, STOP your podcast movie,film site search. This is IT!! The Hollywood Saloon is NOT just two film geeks having an uninformed discussion. It is NOT a movie review thumbs up or thumbs down site.John Jansen and Andy Siems bring a Presentation of Music, Sounds,Movie sound clips, inspired insightful comments and in-depth discussions related to and concerning the subject of FILM. You will end up keeping these Podcasts for their entertainment value and as a source of reference material. I started listening to the Saloon about two years ago and never miss an episode. Great interction between the hosts and insightful disection of genre cinema and its most prominent directors. The show is opinion based and even if you don't always agree with the reviews or ideas given, you definitely respect their intelligent viewpoints. Well produced and edited cleanly. The podcast's corresponding website is also well worth visiting. If you love movies, i mean if you really love movies, this is the podcast for you. This is an incredibly well-researched, well produced show by two guys that have studied and dedicated themselves to the art of filmmaking. Their passion for film and those that make them is evident in every show, and you can't help but get caught up in the excitement. 5 stars!! I'll keep it short: this is by far the best film podcast there is. I went to the number 1 rated film school in the US and can honestly say these guys could've easily taught a class there. Highly highly recommended!! Excellent study broadcasts on cinema! Andy Siems and John Jansen offer cinema criticism and discourse at an academic while still maintaining a sense of entertainment in their podcasts. The overall quality of the hollywood saloon podcasts is of high production value and meticulous research makes listening to their podcasts ,which often lasts hours, at par with serious literature on cinema studies and it furthermore rivals popular documentaries about movies. The Hollywood is certainly worth subscribing to and all of the episodes are worthy of multiple listening. This is THE film podcast I listen to on regular basis. Unlike other film podcasts I have listened to in the past hosts Andy and John are unpretentious down to earth gentleman. They produce a well edited, quality, entertaining podcast which you are able to revisit many times. Their podcast archives contain topics covering film grammer, directors, film series and film commentary. Do yourself a favor and subscribe! The best non-commercial film podcast ever! "Nobody does it better..." - THE SPY WHO LOVED ME Those four words absolutely apply to these two men and their fantastic podcast about the out-and-out love of film. Shows ranging from "Apocalypse Hollywood" to "Never Happened" include serious discussions on film grammar, direction and execution and also fun and loose topics on sci-fi, superhero and action movies. Both subjects are dealt with in the same attitude and zest for cinema. Both Andy and John compliment each other excellently - Andy tends to be the more wild and energetic fanboy (which is the deepest of compliments straight from the heart) whereas John is the more staid, informative voice of reason. They could easily slip into the shoes of film's greatest duos - Marty and Doc, Kirk and Spock, Jules and Vincent, Oscar and Felix, etc. They're like two halves of the same brain! I fully recommend this show! I'm proud to say I've learned things from it and it's made me see cinema in different ways. Nothing is better than sitting in a theater with an audience and for two hours experiencing the same laughs, tears and scares. I honestly wish I could share a movie with these two. They're everything you go to the movies for!!!! Now in it's fifth year, The Hollywood Saloon has continued to defy convention in the film podcast world by creating some of the highest quality programming, no matter the subject or topic. From the very beginning, the Saloon has always been about the unexpected. From feature-length discussion shows, to Commentary Tracks, to Special Edition shows, to S.I.B.S. and recently with Saloon Shots, the shelves at the Saloon are never stocked with the standard soda pop podcast fare. The Archive Shows are like a cellar of fine wine, created and aged until ready. At the Saloon website, you will discover even more off the menu items that will keep you listening and coming back for more. No matter if you are a filmmaker, film lover or just a casual viewer, there will be substance in each show that will inspire and educate. As many other reviewers have stated, the show is not weekly or monthly, and the topic will never be what you expect. New content is released when the hosts have a subject they want to tackle and I can appreciate their candor in recommending other podcasts that perform on a weekly basis. Until they hit the big time or find a wealthy sponsor, this is the only way the Saloon is able to brew. But unlike most any other podcast, the Saloon shows have no expiration date. So a big toast to the Saloon for serving up five years of podcasts as unconventional and inspiring as the directors they cherish on their Wall of Heroes. I fear that the Shots are taking away from what has been a great podcast. The beauty of the Saloon was the depth to which they went on each topic combined with the fact that the topics weren't bound by movie release schedules or current events. Fewer Shots, more depth. Being back the topical Saloon!!!! After my own long hiatus from the Saloon I have been going through the archives lately. The sort of esoteric thing about Andy and John is through their occasional disdain for and about the state of the industry and its players they remind me how much I LOVE movies. So often I find myself chiming in my $0.02. Crazy? Maybe, but this is quality infotainment. This was one of the fist movie podcasts I started listening to, along with Filmspotting. Back when it was a fairly regular podcast, it was enjoyable. Within the last year or so it's gone dormant, but whenever one (or both) of the hosts have a particular gripe with something in the entertainment world, they dust off the saloon and use it as their personal soapbox. Take, for example, the most recent episode, entitled "M. Night... GROAN". Do I want to spend 40 minutes listening to two guys bashing M. Night? No, not really. Nevermind the fact that the movie that inspired the episode was released nearly a month ago, or that its trailer, which spurred the initial groaning, is from two months ago, so the M. Night Bashing Boat had long sailed by the time this podcast was even released. If you're interested in hearing a couple guys bash movies, listen to Destroy All Movies, which is actually funny, and lacks the whiny cynicism and smugness of this newer Hollywood Saloon format. If you want insightful talk on movie news, listen to /Filmcast or The Business. Simply, one of the best film podcasts available! Andy and John may at first come across as two typical film buffs venting their geeky opinions, but very quickly you recognize that these two guys know their stuff. They're educated, intelligent, and passionate, but never overbearing. Even at times when you may not agree with their opinions, their intellectual debates present a valid case that you respect. Furthermore, this is not one of those typical podcasts that just simply review recent films. Andy and John also do shows dedicated to the present and future state of the film industry (APOCALYPSE HOLLYWOOD series) where they break down current problems and propose intelligent strategies to recapture the industry's past glory. Add that with the two leads' great chemistry (their obvious shared passion for film have obviously made for a long and unsinkable friendship), pristine sound quality, and a unique style of sound design (employing film quotes and scores to illustrate the topics of discussion), make this one unique, energetic, and easy listen that automatically beats out any other dull, talking-heads, geek rant podcast. Be sure to check out their website www.hollywood saloon.com for countless hours of extra material! Very Entertaining podcast with great chemistry between the host's. Both Provide very insightful information and incorporates the perfect blend of information about current movies and past flicks... This podcast is like listening to a narrated IMDB. They know so much about so many movies including fun trivia facts, movie mistakes and continuity issues.. Really enjoyable! Only complaint... The month breaks between each new episode! C'mon guys... Get together for an hour a week and record some current shows! And do more commentaries! Thanks. I listen to this podcast any chance I get. This is quality stuff, folks. Andy and John are very knowledgable and interesting hosts. They really delve down into a variety of topics about film. I've learned a lot from listening to their show and have always had a good time doing so. At first I only downloaded the podcasts I knew I wanted to hear: specifically those involving James Bond, Star Wars, Indiana Jones, and superheroes. But after listening to a few of the episodes, I knew I had to download them all, because Andy and John possess a superior knowledge of all things Hollywood. Even subjects that I would not normally find interesting become interesting in the capable hands of the Hollywood Saloon. As awesome as all get-out! I love this podcast. Insightful, entertaining and often hilarious, Andy and John do the film podcast right. And you can do the right thing by subscribing. I'd write more, but really the best way to sample this podcast's brilliance is to just give a listen. I listen to many MANY film podcasts -- T.H.S. blows them all away when it comes to quality and information. John and Andy know the craft and never cease to hold my attention -- even when I think a topic will be boring. This show is NEVER boring! Do yourself a favor and give 'em an ear! My absolute favorite movie podcast, hands down! These guys know their stuff and their conversations about movies are always incredibly informative and highly entertaining. I can't recommend the Hollywood Saloon enough! Give this podcast an Oscar! "The Hollywood Saloon" is a real treat! Great movie discussion, funny and well-made, but not to the point of being slick. This isn't another "what's out in theaters" podcast, it's made for people that love movies. Hands Down The Best Podcast!! A very informative and professional sounding podcast. Every movie lover should have this in the ipod rotation!!! I was absolutely astonished to find such an informative film podcats that even someone with no film education such as myself can immerse themselves in the deeper world of moviemaking beyond the recycled "thumbs up/down" crap I've been force fed for so long without feeling like someone is talking down to you. Because of this podcast I have renewed my exicitement and passion around an industry that has become a REBOOT IT! REMAKE IT! MCFRANCHISE IT! Horrorland. Thanks for sharing your passion and opening up the world of film to an average guy like me who was dying in the desert. Now that just about anyone can grab a mic and record a podcast, it's getting harder and harder to find podcasts that are actually worth listening to. Too often you'll find shows that are simply unbearable. Either the "hosts" think their own lives are more interesting than the subject matter, or they think the audience wants to listen to 45 minutes of them making each other laugh, or they're just too green and the end result is a show full of stammering and barely intelligible rambling, etc. Not so the Hollywood Saloon. It's a true movie lover's dream podcast, hosted by two guys who not only know the subject matter frontwards and backwards, but who are actually capable of having a in-depth disussion about it in a way that's informative and enjoyable. These guys don't spend the entire show laughing and cracking each other up. They discuss, dissect and at times disagree, while sharing their thoughts and insights about a subject matter they clearly love. They don't come off as "experts" (which is always offputting) but rather two knowledgable guys who enjoy good discourse and who do a great job at bringing interesting discussion topics to the table. In a sea of podcast mediocrity, the Hollywood Saloon stands as a great example of how a podcast needs to be more than two guys screwing around with a microphone. The Hollywood Saloon is a fun, informative listen, hosted by two guys who clearly know their stuff. Whether you agree or disagree with their takes on the subject matter- you always enjoy listening to the discussion. The Hollywood Saloon is a joy to listen to. The Hollywood Saloon is easy listening of the endless discussions and debates that film making encourages. If Hollywood would listen, they might learn a thing or two about the mistakes they keep making. But unfortunately, business is business. As long as Hollywood keeps making money, crap will flow, leaving only a chaotic environment for the diamonds-in-the-rough to shine through. Much the same way The Hollywood Saloon is a jewel to be discovered on iTunes. * = but gosh darn do they take forever between additions! I'd be willing to accept less in production values to get new ones with greater expediency. The quality of the show is five star but at this point I have to lower it down a notch on the rating scale because by the time they get around to completing a show, what they're talking about is no longer topical. The Saloon Shots were a great idea since they don't require the time-consumption that bogs down the release of their few-and-far-between regular podcast episodes, but frankly I think the topics have left a lot to be desired...where's a Summer 2009 breakdown or an examination of the Avatar marketing that's been heavily discussed everywhere else but here? I'm always revisiting the regular shows that they pour so much imagination and effort into, but in my opinion the Saloon Shots have taken on a little bit of the "McMovie" whiff that they always lament in mainstream filmmaking - where something you see is designed to be disposable and instantly forgotten. The "Rat-Branded" Saloon Shot was the first time I turned off one of their shows halfway through because of complete lack of interest about the content. 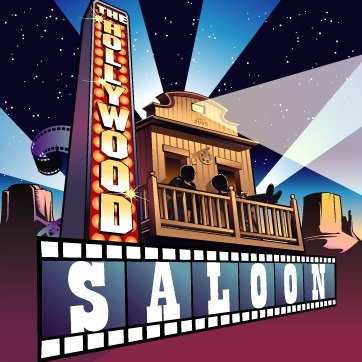 I gotta say, I have listened to alot of podcasts and watched alot of online movie sites, but the Hollywood Saloon is THE VERY BEST movie podcast I have encountered. John and Andy have a wonderful approach to the film medium, and their invalaubale insight is not only a contstant encouragement to wannabe filmmakers like myself but also a strong tutorial for anyone interested in understanding the mystery behind the power of the movies. Their show is long, in-depth, and thorough, offering not only an informed opinon but also an education!!! Listen to the Saloon Now!!! The hosts' passion and knowledge of film is refreshing. Very in depth shows and lite humour makes for a great way to entertain yourself while commuting to work and/or listening at work. Entertaining but designed for those who not only want to view but learn from film. The Saloon is easily the best podcast I have subscribed to. Whether the subject is yearning for James Cameron's upcoming 'Avatar,' gushing for an hour over Joss Whedon's 'Serenity,' or ranting--which is hysterical--of "McMovies," Siems and Jansen's podcast is easily the most entertainment a person can pump into their ears.